People often ask how the Peloton platooning solution is able to deliver its superior levels of safety, efficiency, and control. Much of the answer lies in our Network Operations Cloud (NOC). Supervision. The NOC supervises the automated Peloton platooning system, approving and authorizing driver pairs to form a platoon. The cloud monitors real-time traffic, weather, construction, and other driving conditions, to make sure that platooning happens only when, where, and how it’s safe. If it’s determined that platooning is ill-advised for some reason, the cloud will withdraw the ability to platoon for a particular segment of the route. Additionally, the Peloton cloud provides information and alerts to truck drivers—whether or not they’re actively platooning—about the upcoming driving environment. Based on forecasting data from the National Weather Service, the Peloton cloud can warn drivers throughout the United States about adverse weather conditions, like snow or fog, that lie ahead. The cloud can also pass along up-to-date information about traffic slow-downs that may lie ahead on the route. That way, drivers can make better decisions about whether, for instance, to pull into a rest stop to wait for conditions to improve. Coordination. The full benefit of the Peloton system is realized when two trucks platoon, which requires they rendezvous on the road. Even in initial deployments, where the two trucks are from the same fleet and are leaving at roughly the same time, coordinating the two trucks is a critical feature to maximize platooning mileage and minimize or eliminate delay. Fleet managers use the NOC as a kind of matching service for platooning, pairing trucks and drivers based on a range of factors. The Peloton cloud determines whether the trucks and drivers attempting to platoon are compatible before pairing them. Are the intended routes similar, and how much overlap do they have, both schedule-wise and road choice? What is each driver’s platooning history and reputation? Is one likely to stop unexpectedly for a meal break, for instance? How soon is each driver planning to leave, and where will the two trucks meet up? The NOC is also built to tie-in to third-party systems including fleet management systems and in-house systems of fleet operators. With this functionality, platoons can be coordinated ahead of time to, for example, adjust dispatch timing or other logistics parameters. Data analytics. Peloton’s Network Operations Cloud combines data from trucks using our platooning system with third-party data to develop analytics for fleet customers about not only safe driving conditions but also fuel use, driver evaluations, and other platooning statistics. The goal is to equip fleet operators, especially, with detailed knowledge about where platooning is most economically viable for them and which platooning opportunities are the best options for their particular requirements. The Peloton cloud develops models for ‘normal’ operating conditions on highways where platooning takes place so that it can detect when situations deviate from normal. For instance, it can identify probable accidents, new construction zones, or bridge failures by noticing variations in vehicle behavior on known stretches of highway. The cloud can also help predict variations in fuel efficiency caused by the terrain in a particular locale, such as particularly hilly areas. By aggregating data from all the trucks using the Peloton system, the cloud can provide increasingly accurate alerts and useful analytics. The Peloton cloud uses aggregated data to detect patterns; all data moving between a Platoon Pro system and the NOC is transmitted through encrypted channels, and all persisted data is encrypted at rest. Our portal uses a secure, multi-tenant architecture that keeps each platooning customer’s data separate and private, and access to data that might be used to identify individual driver behaviors or fleet operation patterns is strictly limited and controlled. Peloton offers a portal to its Network Operations Cloud that allows fleets managers to optimize platooning for their operations. The portal provides high-level overviews as well as hub-, route-, and truck-level details of platooning use and fuel consumption; comparisons between various geographies and regions; and a live map that gives a real-time view of truck locations, movement, and platooning issues. At the driver level, the Peloton Network Operations Cloud provides tremendous peace of mind. 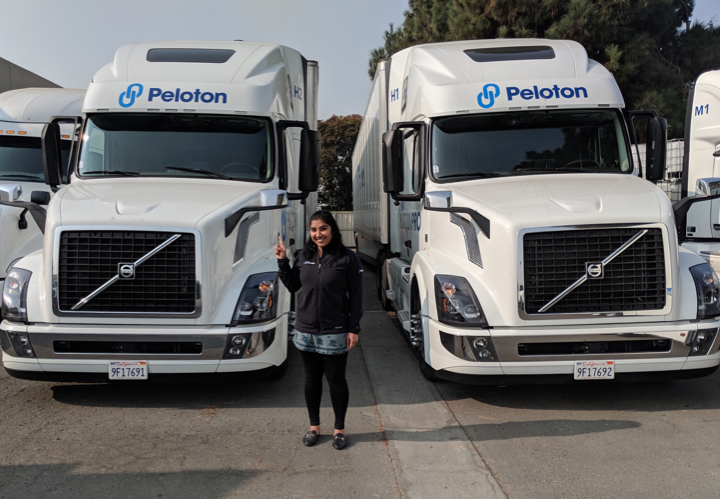 From being paired with a compatible driver to engaging in all aspects of the platooning process, drivers can be confident that the Peloton cloud is working to improve their overall safety, comfort, and control. For more information on how the Peloton platooning system works, including the role of the Network Operations Cloud, visit the Peloton website.